Gold Rush, a fun and exciting online slot game developed by Pragmatic, has a few added visual features and cartoon-like images. This mining-themed game has a 5×3 cross- platform and 25 fixed paylines. In addition, there are the symbols which depict the theme like carts of gold nuggets, sticks of dynamite, lanterns, pickaxes and barrels that are sure to make your game time worth the while and even more! Read further to know more about this fun-filled online slot game. 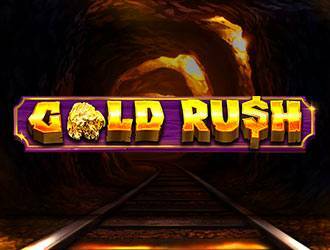 Gold Rush slot game has a 5×3 cross- platform and 25 fixed paylines. Also, some new amazing features like the free spins bonus which can earn you free spins when triggered has been added to increase your fun and payouts when you play. In addition, this slot game gives you the chance to change your bet per line when you click on the ‘Bet Level +/-’ button and also increase your bet as well as coins when you click on the ‘Coin +/-’ button. In this slot game, to trigger the Free Spin bonus feature, you need three or more packs of dynamites on the reel and the number of free spins you get is dependent on the number of scatter symbols that appear. You can earn either 10, 12 or 15 free spin, However getting a free spin will cause the mine to collapse and 3 -15 symbol then lands on the reel. Incidentally, this feature cannot be triggered again. Sticks of Dynamites: When the free spins are triggered, it causes the mine to collapse and then the dynamite goes off on the screen. A random symbol then appears and gives you a chance for a big win. Gold Nuggets: this symbol allows you to score more wins. When you get five of these gold nuggets, you can now strike gold. Striking gold with the gold nuggets symbol gives you an instant payout of 1000 coins. Yes, Gold Rush allows you to gamble and double your win or perhaps lose what you won. When you play the Gambling feature, you are given a chance to choose a card that has got a higher value than that of the dealer. If you make a correct guess you win however, otherwise means a loss of all you won. Gold Rush is one that represents a slot game in its proper definition with free spins, enjoyable gambling and lovely payouts, and it’s packed with so much fun that it will have you keep coming back for a replay.